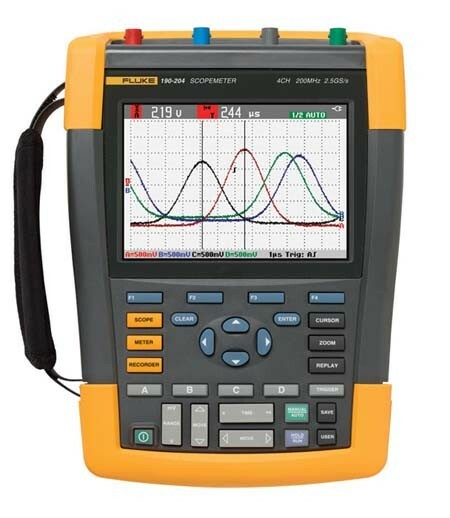 The new Fluke 190-104 Series I ScopeMeter is a 4-channel portable hand held oscilloscope built for CAT III & IV environments. It easily works with 3-phase applications for many industrial applications like motors and variable speed drives and includes all the key features of the original Fluke 190 series ScopeMeters. The Fluke 190 series of portable oscilloscopes are now extended with new 4 channel models designed for the industrial plant maintenance professionals servicing, installing or maintaining heavy duty electrical equipment, electro-mechanical machinery and plant automation control systems. The 190 series II ScopeMeters are the first portable oscilloscopes with a 1000 V CAT III / 600 V CAT IV safety rating. Fluke ScopeMeter test tools are hand held, battery operated portable instruments with a sealed, dust and drip proof case that is IP 51 rated, designed to be used in harsh environments. The new Fluke 190 series II now includes new features for troubleshooting today’s industrial power electronic systems and enhancements that will improve usability and overall satisfaction.